Rising from the desert, Dubai is a consortium of ascending shapes that tilt, teeter and bulge, gleaming by day and glowing by night. They form dense forests that scream with architectural bravado, and with nary a solar panel in sight. I enter this place of concrete, steel and glass bewildered; it feels like a dark near future already arrived, the opening scene of a science fiction film, minus the levitating transport (watch this space?). I’m told that sometimes the tops of the buildings catch fire in the blazing heat, explaining the charred skeleton of a tower I point out as we pass. 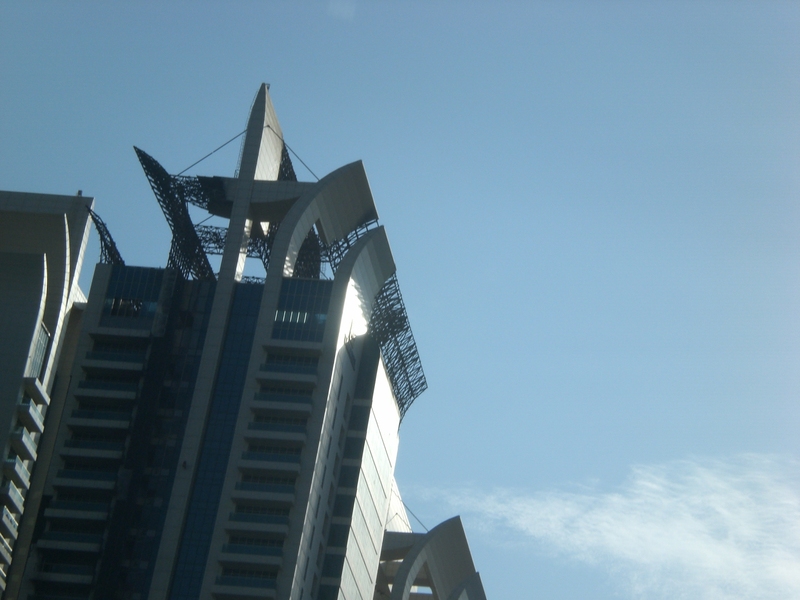 I mostly experience the city from the seat of a car, peering upwards at impossible angles. As far as first impressions go, Dubai lives up to its reputation as an empty shell of capitalist ambition. Unfinished building sites, abandoned after 2008, expose wiry, rusted guts protruding from half poured concrete. On the other side of the spectrum, hotel vestibules ring with grand notes of artificiality, dripping with gilded ornament and garish lighting. The coffee is heaven, as rich as the fittings. An aquarium at the Atlantis Palm Hotel and Resort is so enormous, chocked full of artificial ruins and fish of all species, that it threatens to be the highlight of my trip. Deira shows me something more, with its old port and painted dows moving back and forth across the narrow channel. We enjoy grilled fish in a restaurant that I’m told used to be much cheaper and more ‘authentic’, run by a local fishing family. But the steady stream of comfort-seeking tourists has left its mark here, with factory line furnishings replacing the former character of the place. Tatters are for the Old World, it would seem. Afterwards we get lost looking for the museum sector, and I lose my temper. Newly built heritage villages show us how life was once lived in this desert civilisation, vacant mannequins staring out from staged sets, making traditional crafts and pouring hot drinks. They inadvertently draw attention to a strange and unsettling absence: history has no place here. 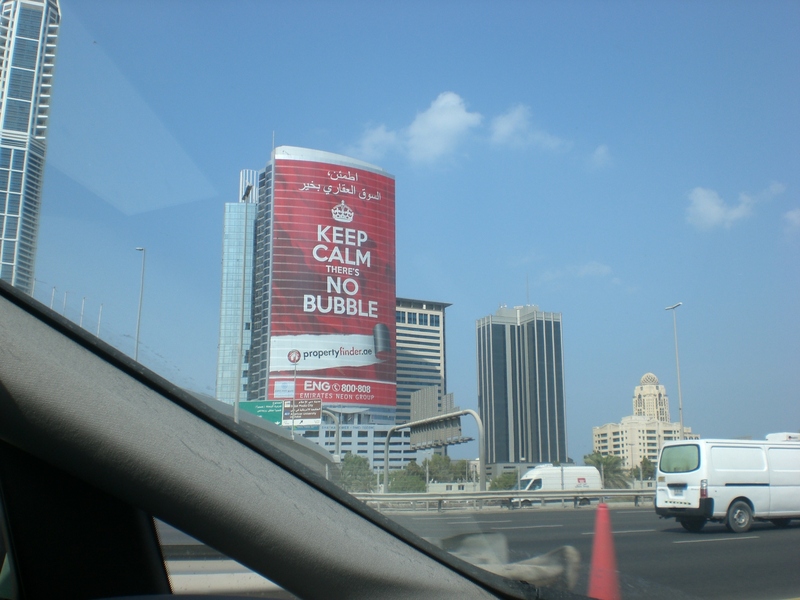 An empire of privilege, Dubai is a city reserved for those who can afford it. Pleasure and indulgence are promised to those who visit and spend. For those destined to construction and service industries, the ceiling stops at the meagre wages that feed their families back home. Air conditioning seeps out from every interior, cold compartments that make the heat bearable in the summer months. I sit on the patio and drink my coffee. I complain because they served it in the wrong kind of cup. The waiters misunderstand my English because I am speaking too quickly. Impatience and cruelty are contagious. The epic proportions of the Jumeirah Mosque are matched only by the richness of its interiors. 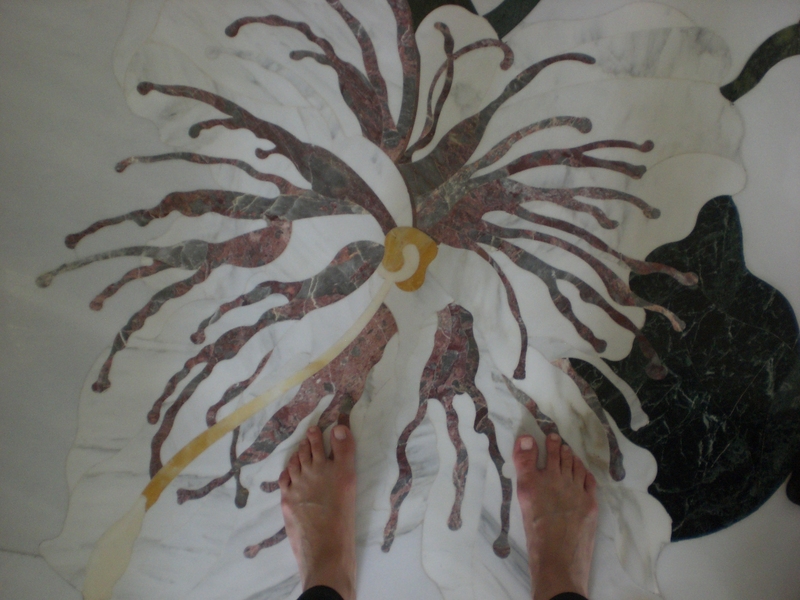 Delicate floral designs inlay the marbled entrance where tourists mill about after removing their shoes. The cool surface of the floors is sensuous on my bare feet, and I am suddenly struck by the inappropriateness of such a pleasure in this sacred space. As we move throughout the vast prayer hall I am moved by our barefoot procession, a motley bunch from across the globe (primarily non-Muslim, by the look of many a skewed headscarf) shuffling along the carpeted floors and looking about with jaws agape. This experience is no different than the livestock herding experience of most iconic religious monuments, except that it was built in 1976. The tourist board promotes the ‘open doors, open minds’ policy of the mosque, which offers access to tourists 6 days a week. Cars are fast and lanes congested, so when it starts to thunderstorm (a rare event, with only 3-4 days of rain per year), accidents abound. 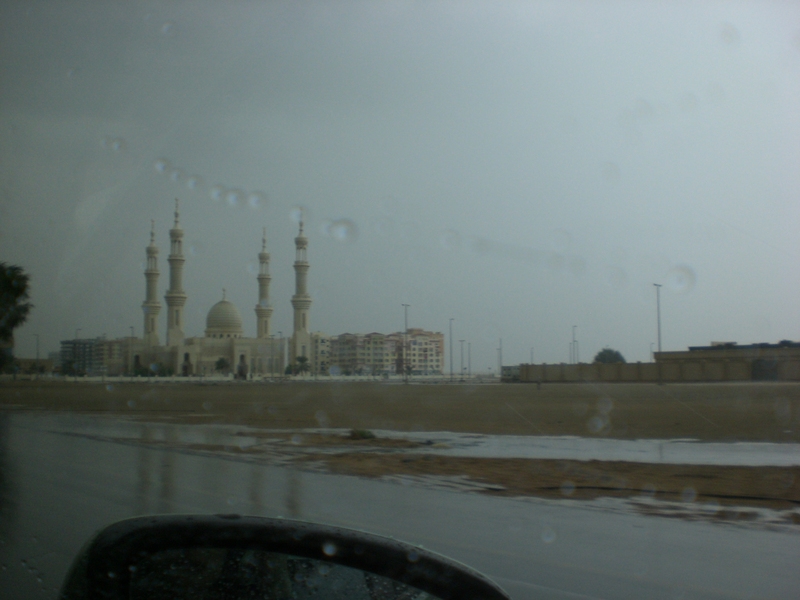 We are driving through the desert when it hits, and the rain collects in the wadis, or dry riverbeds, and overflow onto the roads. It’s dangerous, but exciting. We drive to a hotel at the edge of the emirate to eat, where tourists in the waiting lounge look on lost and disappointed at the downpour – there’s not much to do without the sun. I’m glad their dreams of an effortless packaged holiday have been shattered. I came here as a cultural tourist, I think smugly… but then why then do we find ourselves in the same place? I come to realise that universalism has come to stand in for internationalism, a bleak reality that is the source of my recurring bouts of despair. Tim Hortons, a Canadian coffee chain, has taken off in Dubai (52 locations and counting), and I find myself wanting to return to them because they remind me of home. I’m having a cultural identity crisis, I think, as I sip my predictably mediocre filter coffee and munch my bagel with light cream cheese. 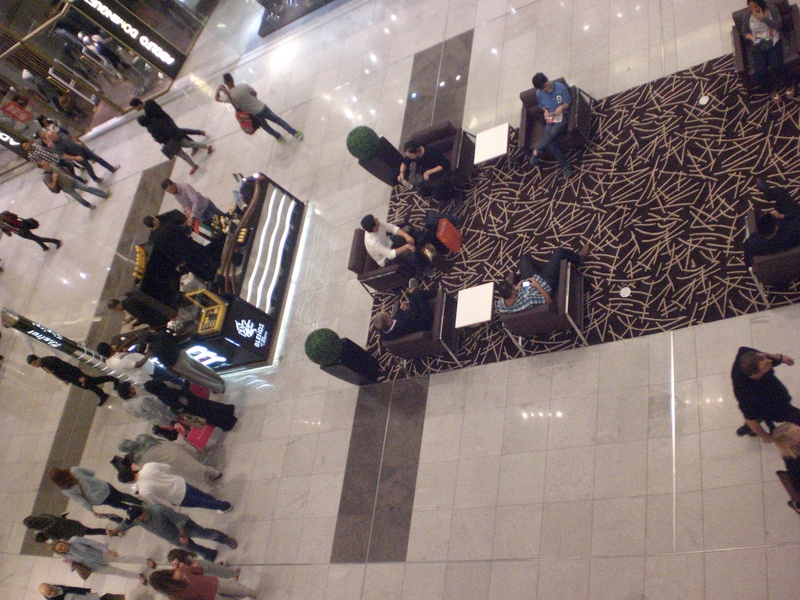 Later, observing from a balcony of the colossal Dubai mall, I’m amazed at the diversity of this place. So many nationalities and regionalities, and all the nuanced pockets in between – and yet it all moves behind a wall of glass, inaccessible and removed from an actual cross-cultural experience. These citizens of the world, a magnificent polyphony, are like so many fish in an oversized, over-embellished tank. They move past each other in shoals as I watch transfixed, always on the outside. In this mall-city we share nothing but the consumer culture that envelops us at every turn. Art Abu Dhabi is a playground for agents, sponsors and dignitaries, and I find myself strangely out of place. I try to focus on the art, which has a wide international spread but is not on the whole very daring. Over half the works have sold by the private opening, and there are triumphant orange stickers everywhere. The majority of my attempts to discuss artworks are met with business cards and sales catalogues. My own freshly printed cards are regarded with little interest – I learn from an ex-pat curator that ‘Art Historian’ is not a favoured title here, and that criticality and art are not easy bedfellows. I witness this first hand at a panel discussion with Jenny Holzer a few days later, when the famous conceptional artist was cut short after 4 minutes to make room for the heavy-handed promotional agendas of architects and curators. I feel alone in my desire to talk about the ideas and concepts that underpin artistic practice. Surely that is the fastest route to transcultural exchange and understanding? Maybe I’m missing the point. My glimpses of traditional UAE life were few, and easy to cherish. 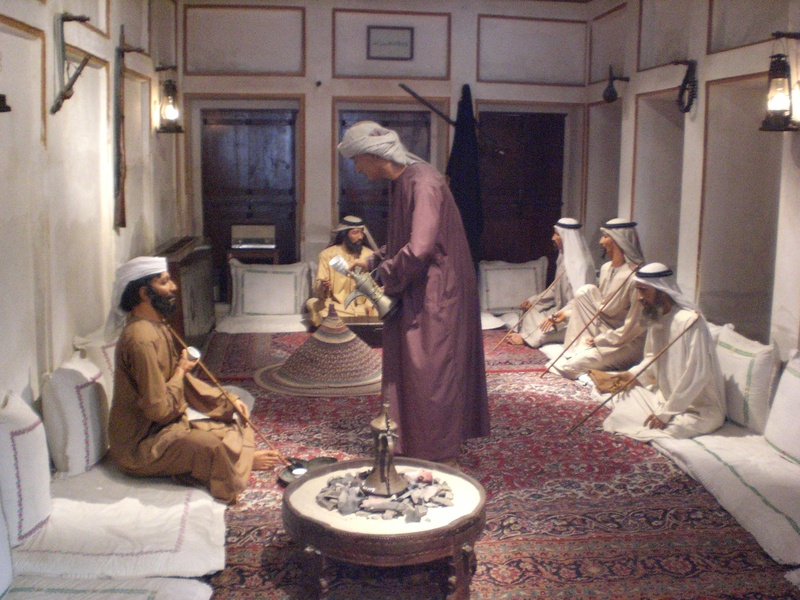 They happened in the desert, where Emirati culture still exists in some form. Early one evening we passed some vehicles parked in the dunes off the side of the road, with groups sitting together in the sand. I ask what they are doing, and my ever-knowledgeable host explains that this is a normal after-dinner ritual for families, a relaxed social time that is framed by the silence and calm of the desert. I am inspired, and relieved. This is the antithesis of the mall and hotel culture that I thought had replaced whatever culture or history once existed here. 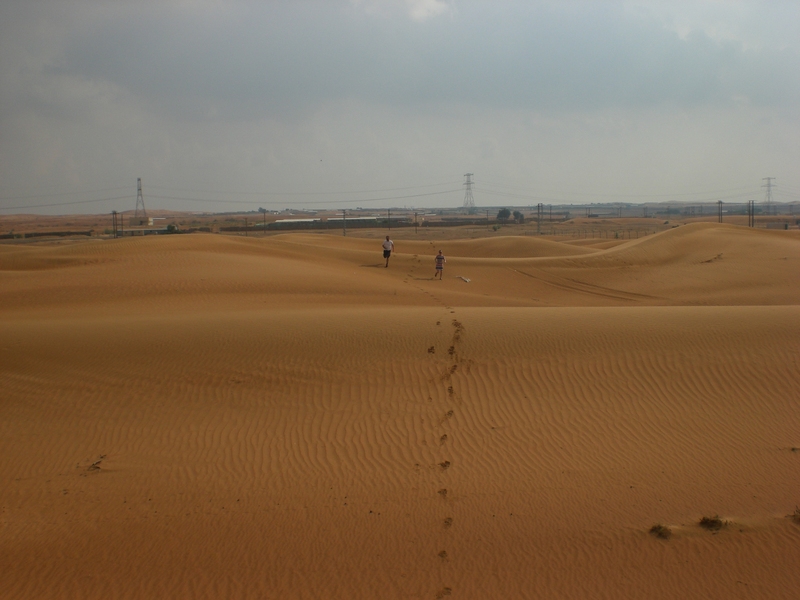 I celebrated the desert by riding an Arabian horse with my equestrian friend, and enjoyed a brief sprint across the dunes a few days later. Casting my gaze back on the shimmering dystopia that is Dubai, I found myself comforted by the endless sea of sand that lay between us. My trip was last November, and now seems like ages ago. I hesitated to write this post because I couldn’t make my mind up about this place and my experience of it. I didn’t expect to like Dubai, for reasons that I have confirmed and clarified above, but it did challenge me in unexpected ways. I’m disheartened by the failure of these new global cities to celebrate their diversity, and by the irreversible damage that capitalism (neoliberalism) has done to the cultural and environmental fabric of the Middle East. 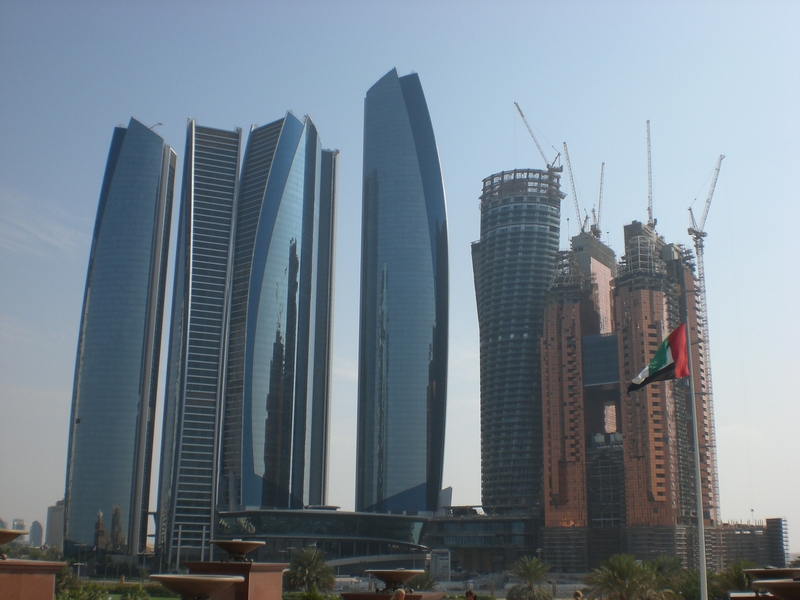 At the same time, the UAE is building cities that reflect in no uncertain terms the social and economic realities of our time. It is not a mirage but a mirror held up to our greed, complacency and individualism. Whilst developed nations elsewhere make valiant claims for their attempts at social, racial and gender equality, Dubai is unashamed of its hierarchies. It is a place where the edges of difference are sharp and uncompromising. For all its false pretentions, this city shows its true colours. 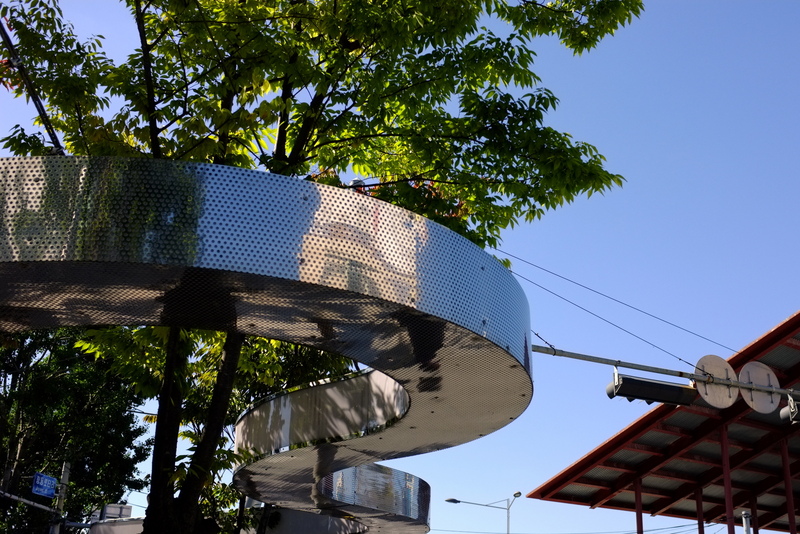 Guest blogger Ben Cowburn meanders around a ring of modern follies in one of South Korea’s biggest and art-friendliest cities. 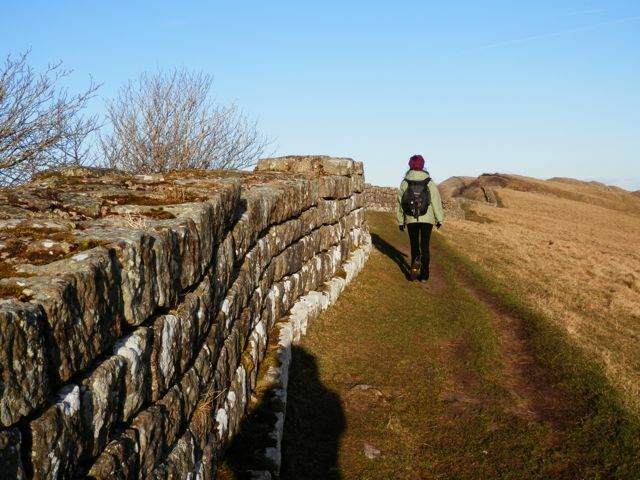 Hadrian’s Wall offers some of the best walks in Britain, as I recently discovered. Only a short bus journey from Carlisle or Newcastle and on a scale that only the Romans would aspire, it hugs the natural ridges and folds of the countryside for over 73 miles (116 km). In its antique glory the wall was as thick as 3 metres in places and from 5 to 6 metres high, and was probably intended as a colossal lookout post and monument to the power of the Empire, rather than a defensive wall against the ‘barbarians’ of the north (the Romans would ride out and put a swift end to attackers long before they reached the Wall). With its forts, milecastles and turrets built alongside or in short distance, the wall was also home to Roman soldiers and auxiliary troops who held the frontier in Great Britain from the second to the fifth century AD. There are plenty more factoids where these come from, readily available in the guidebooks and the two museums that commemorate the Wall and contain collections of artefacts from multiple excavation sites, some of which are still active today. One can only balk at the barefaced determination of the Romans, and marvel at their achievement (the entire length of the Wall is thought to have been built in only six years, rather unbelievably!). 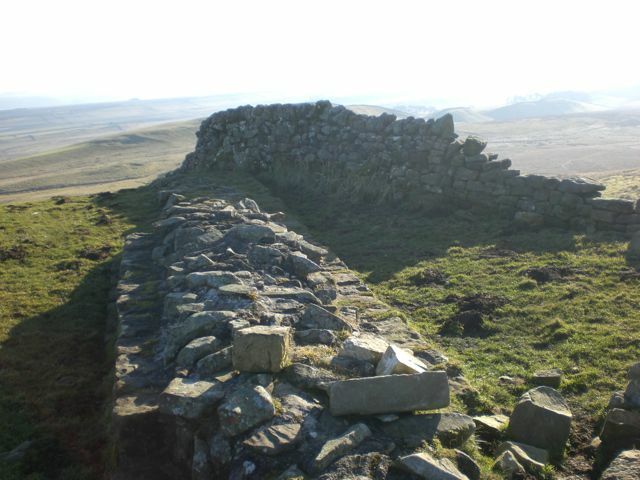 Alongside the volumes of scholarship dedicated to deepening our understanding its material and cultural history, the legacy of Hadrian’s Wall also lives on within literature, most recently as ‘The Wall’ in George R. R. Martin’s fantasy fiction series Game of Thrones. When walking the Wall (we covered a stretch from Haltwhistle to Heydon Bridge over two days), it becomes clear that some sections are in much better condition than others. There are lengths of wall where the stones are mostly depleted or where it disappears altogether, replaced by modern dry stone fences as a sort of placeholder. During these stretches there is often a parallel track where the debris of the original wall has been overtaken by the earth, resulting in a slightly raised section. At some points it is possible to see intact but partial remains of the original Roman wall, with an outer casing of precisely cut and fitted stones and a filling of gravel. But the sections that are perhaps most interesting – at least for my purposes here – are those that were rebuilt during the nineteenth century. Constructed to resemble the ancient wall in a less complete stage of deterioration, the Victorian wall is an integrated folly that grows almost seamlessly from the original ruin. In 1834, antiquarian and town clerk of Newcastle-upon-Tyne, John Clayton, began buying up areas of land where the Wall was built – by this time its stones were being quarried and pillaged for use in local buildings and roads – in order to preserve and restore what remained. As a result, several miles of the Wall were rebuilt using remaining or recovered materials, which are indistinguishable from the Roman Wall. Art Historian and Classicist Mary Beard has commented on how the ‘ancient’ Wall as we see it today was actually built by Victorians, a common practice that is often (falsely) linked with nineteenth-century imperialism. Whatever their reasons, in the attempt to recreate the past, restorers and antiquarians produced ‘fakes’ which were then reabsorbed into the fabric of Antiquity, and our understanding of it. Taking in the landscape from a number of vantage points, it is easy to see the picturesque appeal behind the nineteenth-century restorations. The Wall follows the natural curvature of the earth, tracing the semi-mountainous hills and cliffs. From afar it appears as a delicate trim, while up close it is palpably robust, an achievement born of sweat and ingenuity. Clayton must have recognised an opportunity to restore this beautiful landscape feature while demonstrating the Victorian aptitude for building in brick. He employed workmen to rebuild sections of the wall up to ‘seven courses’ in height, a substantial increase to what was most likely a ribbon of ankle-deep piles of stones. The section called the ‘Clayton Wall’ is a folly of a sort, built from Roman spolia to resemble the ruin at a less advanced stage of disintegration. The urgency with which he acquired sections of the wall reflects his preservationist agenda, but it also betrays his desire to ‘return’ the original Wall to a more desirable or aesthetically pleasing stage of its disintegration. In reversing the destructive effects of quarrying and the removal of stones for local building projects, he was not attempting to restore Antiquity, but rather to approximate the effects of natural erosion and exposure to the elements. His project was rooted in a Romantic nostalgia for the ruin, not in scientific conservation. Clayton’s folly is a subtle one; walkers are left guessing which sections of the Wall are original and which are modern additions (if they are aware of them at all). I found myself playing this guessing game as I continued along the well-trodden path. Ultimately, does it matter whether we can tell the original wall apart from the sections rebuilt from bits from the original wall? Where does the real wall end and its later stages begin? What is ‘real’ in this context, and what is folly? Shortly after visiting Hadrian’s outpost I made a timely trip to Rome, and was surprised to learn that the Ancient Romans themselves had a penchant for follies. 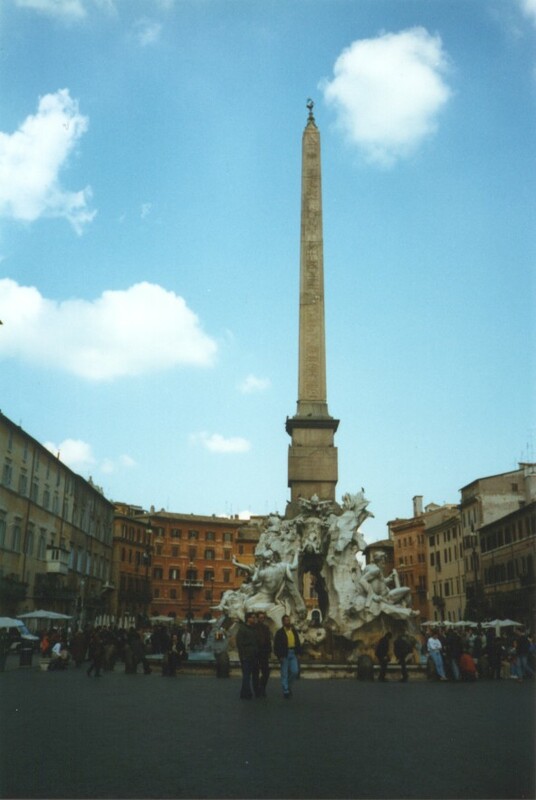 The Egyptian obelisk that currently sits in the Piazza Navona, with Bernini’s Fontana de Quattro Fuimi acting as its handsome base, is in fact a copy, commissioned by Emperor Domitan in the first century. Not satisfied with the existing spoils, it was apparently common practice for replicas of war trophies to be made and erected throughout the city as statements of power over conquered territories. A replica isn’t exactly a folly, granted, but the process of producing fake monuments to stand in for originals is not so different from creating ornamental buildings or ruins. I wonder if the Romans valued these copies as much as the originals, or if the average Roman citizen was even aware that they were fakes? The triumphalist symbolism of the obelisk (this one was originally erected at the Temple of Serapis), was presumably the same, and it would be interesting to know whether its reproduction through Roman commission detracted from its authenticity (aura) at the time.